The U.S. president also accused Google of "really taking advantage of people." Prime Minister Justin Trudeau speaks to students at l'école secondaire catholique Cite des Jeunes in Kapuskasing, Ont. on Aug. 29, 2018. OTTAWA — Prime Minister Justin Trudeau pledged to "always defend" an independent press when asked to comment Wednesday on U.S. President Donald Trump's recent attacks against the news organizations. 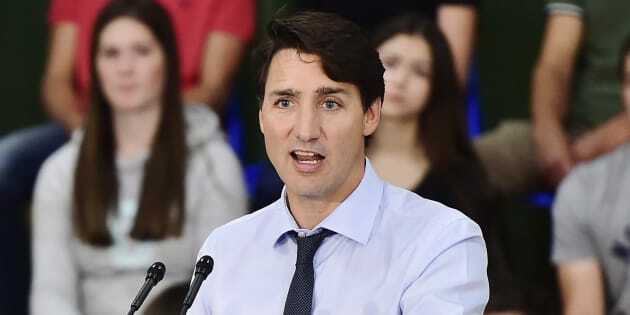 Calling the media a "fundamental element of a democracy," Trudeau said: "The media must be there to ask questions, at times difficult — often difficult — to political leaders on behalf of the population. "We must have analysis to say what we are doing that is good and what we are doing that is less good. It is an essential element of a democracy." Noting the wide range of perspectives in the media, Trudeau said different outlooks are needed and political leaders should have confidence that the public can read, consume, and reflect on those different points of view. Trump, who has routinely labelled news outlets he doesn't like as "fake news," escalated his public relations war against the press this month by repeating in a tweet that journalists are the "enemy of the people." He said the media sow "great division and distrust" and are "very dangerous and sick." Noted Watergate journalist Carl Bernstein commented that former U.S. president Richard Nixon never went so far in his criticism of reporters as to label them the "enemy" of the republic. U.S. President Donald Trump listens during a meeting in the Roosevelt Room of the White House on Aug. 29, 2018. Two human rights experts expressed concern the president's attacks increase the risks of violence towards journalists. "[Trump's] attacks are strategic, designed to undermine confidence in reporting and raise doubts about verifiable facts," David Kaye and Edison Lanza, Special Rapporteurs on freedom of expression for the United Nations and the Inter-American Commission on Human Rights, said in a statement. They said Trump and others in his administration have sought to undermine reporting that uncovered waste, fraud, abuse, potential illegal conduct, and disinformation. "Each time the president calls the media 'the enemy of the people' or fails to allow questions from reporters from disfavoured outlets, he suggests nefarious motivations or animus. But he has failed to show even once that specific reporting has been driven by any untoward motivations," they wrote. On Tuesday, Trump led with a new attack, this time choosing as his target Google, Facebook and Twitter, and alleging — without evidence — that the Internet giants are rigging search results to make his administration look bad. "Google is really taking advantage of people and it's a really serious thing and a very serious charge," Trump said. "...they have to be careful." File photo of icons for the Facebook and Twitter applications are displayed on a smart phone in front of Google website. When an authoritarian system gains a toehold, one of the first things to go is the free press, Trudeau seemed to suggest Wednesday. "One of the first things to leave — if there are no media to challenge governments," he said, "is the confidence of people in those governments, if they feel political leaders are doing whatever they wish." The prime minister said he thinks having the media there to regularly ask questions allows him and his cabinet to govern better. "I will always defend the role of the media, always [defend] the freedom of speech, always [defend] our capacity as a democracy to ask difficult questions to our political leaders and our governments," he said. "... that is an essential role that we must defend in Canada and around the world."